December’s Science Mind of the month embodies many of the qualities of any classic superhero: independence, resourcefulness and kindness. Heroic neutron Ella Burks says that if she could assist any superhero for a day, “it would be DC Comic’s Batgirl! I want to help her catch bad people!”. There aren’t any bad guys to catch at Science Cosmos, but Ella channels her inner super hero as she assists other builders in looking for pieces and assembling hard to construct projects. 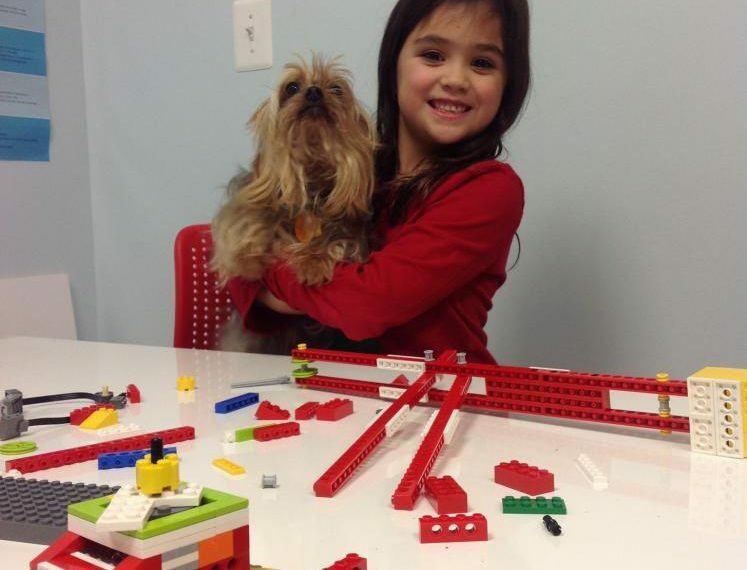 Ella joined the ranks of Science Cosmos this past summer and she loves Legos almost as much as she loves her tiny Yorkshire terrier, Gertie. Ella has spent the last several months learning how pulleys, axles, and gears can be combined to create the fun animal themed Robots that comprise the Lego WeDo curriculum. Ella knows exactly which Lego components she needs and can assemble them with ease and confidence. So what does a minute superhero like Ella get out of her Science Cosmos classes? Ella’s mom says, “Science Cosmos has nurtured her creativity, problem solving skills, and has helped her follow step by step instructions. Ella’s mom also hopes that Ella, “can excel further into more advanced classes”. With Ella’s competence and enthusiasm, we are sure she will go far!